Boston’s Fenway Park, home of the Red Sox, has witnessed many historic baseball moments in its storied past. There was Carlton Fisk’s famous foul-pole homerun during Game 6 of the 1975 World Series. The famous comeback against the rival New York Yankees during the 2004 American League Champion Series is also a notable memory. Plus, the park has hosted countless legends through the years, with Ted Williams at the top of the list. 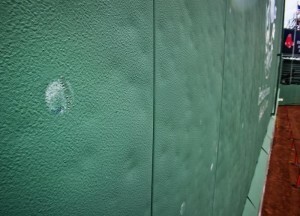 A baseball tattooed on the Green Monster. 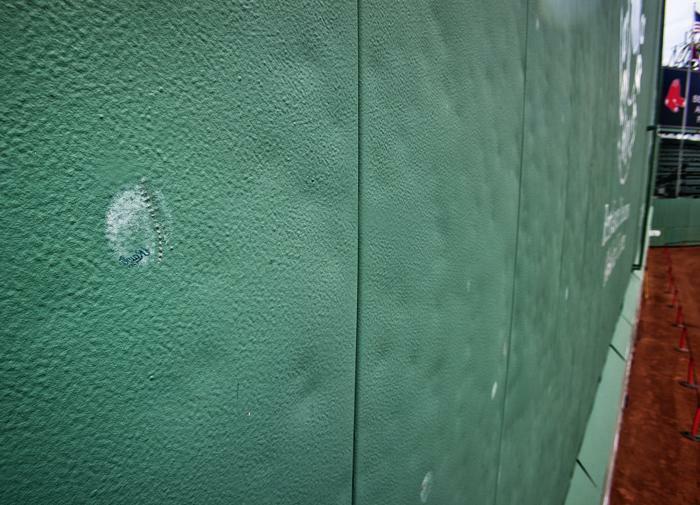 Through it all, one constant has been the park’s famous left field wall, known in baseball lore as The Green Monster. The Monster is where many would-be homeruns have gone to die, only ending up as doubles or triples. But how many hits has the Green Monster taken? Thanks to a telescoping boom lift, researchers recently found out. So what’s the answer? How many dimples does the Green Monster’s glorious face have? That’s just fancy speak for saying “where, how many and which ones.” The 2-person team and the ImageGraphicsVideo staff came up with 2 different numbers. Hey, it’s baseball – you always have to argue about numbers. The newspaper folks came up with 211,044 dents, while the photo analysis counted 164,630 dings and dimples. So, if Fenway Park can stay open another 400 years, it may witness the 1 millionth thwack of a baseball! If you think the Green Monster is well known, wait until you see the training offered by CertifyMeOnline.net. Our top-of-the-line courses include fall protection, trainer instruction, aerial lifts, scissor lifts and more. And with OSHA-approved content, our clients also have a better chance at finding those hard-to-find jobs. To learn more about what CMO has to offer, please visit our contact page or call our team of OSHA experts and instructors at (602) 277-0615. We’re here to help you hit a homerun with your training! Thank you for reading the CMO blog. This entry was posted in Aerial Lift Training on August 26, 2014 by admin.